Promo codes can be configured to apply to one, or multiple payments or invoices. You can manage discount codes from your paywhirl account. You can setup as many promo codes, coupons or discounts on as you need on PayWhirl. However, if you don't plan on using them you should disable the option in your account settings menu. Some customers may try to search for a promo code when they see that field, which can decrease conversions. 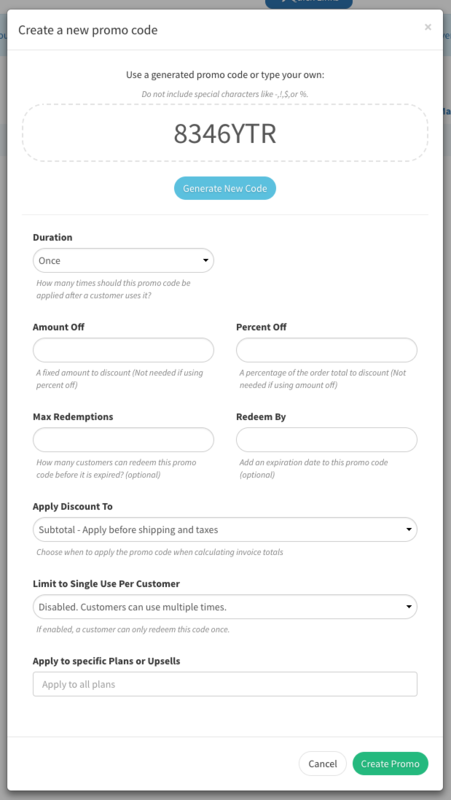 When you create a new discount code you will see several settings that allow you to control how the code will be applied to subscription purchases when customers use it in the future. Apply Discount To - Subtotal (before shipping and taxes have been applied) or Grand Total (after shipping and taxes have been applied). You can choose how the discount works with shipping and tax rules. Promo codes can be calculated after you calculate the tax and shipping total or before. For example, you may want to ensure that customers pay full price for shipping, even if they are using a promo code. In that is the case select 'subtotal'. Note: Promo codes associated to specific plans will only discount the plan's subtotal amount. Limit to Single Use Per Customer - Prevents the same user from applying the code a second time. Apply to Specific Plans or Upsells - Will limit the use of a promo code to specific plan(s) and/or upsell(s) in your account. You can select which plan(s) and/or upsell(s) the promo code should apply to and customers will only be able to apply the promo code to if they are purchasing one of the associated plans or upsells. You can also create, associate or edit the association of a coupon code with specific plan(s) from the INDIVIDUAL PLAN SETTINGS pages in your account. NOTE: Make sure not to use special characters like ! @#$%^&*() in your promo codes or in the amount / percent off sections. This will prevent the form from saving. By default, customers can use a promo code on checkout and/or in their customer portal on existing subscriptions. If you don't want customers to be able to add a promo codes to existing subscriptions, you can disable the functionality in Account Settings > My Account > Advanced Settings. 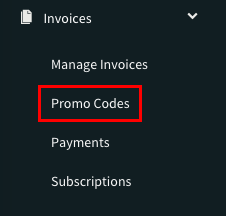 Finally, as a PayWhirl account manager, you can always add promo codes for your customers from the invoice view in the admin section of your account. If you have any questions about how promo codes work please let us know!